So, after my post the other week looking at various cheap/free fence ideas, I decided to go for the bamboo option in order to separate my hens from the veg patch. I have since made a start, cutting down several bamboo canes from the 5 clumps that we have growing (somewhat enthusiastically!) in the garden. I have to say, it’s going well and with 50mph winds last night, it’s still standing so I’m feeling strong! The general principal of my bamboo fence is to have sturdy posts at 1.5m/2m intervals, with bamboo canes prodded into the soil in between, approximately 10cm apart (just narrow enough that the hens shouldn’t be able to squeeze through. Then, I’ve weaved a trellis with horizontal canes. Using wire, I have tied the canes where they cross over, but only on the top row, and a few other random places where it looked a bit loose. 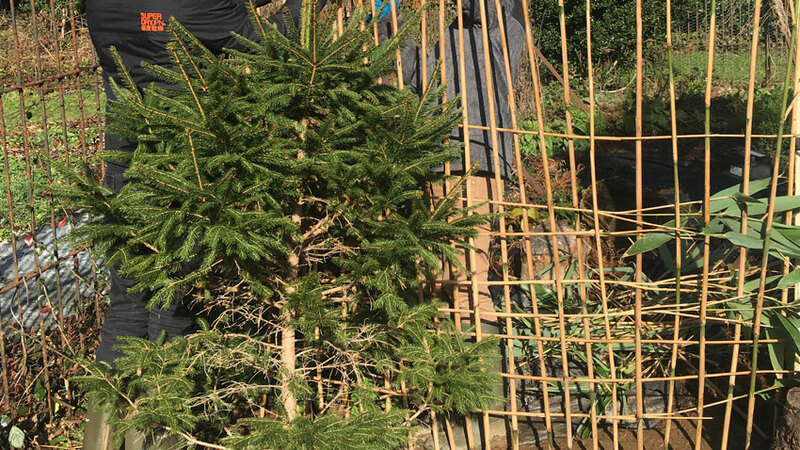 The trellis like weaving has made the fence really quite strong, and with the posts at intervals, it’s impressively sturdy for what is essentially quite a flimsy material. If you have access to bamboo, and need to put a fence around your veg patch for any reason, then I’d definitely recommend giving it a go as it is working out to be very cheap indeed! !